JCUA is taking action to make civic engagement a priority for Chicago’s Jewish community. This is a critical time in our city – if we want a mayor and city council that will support our campaigns to create a more just Chicago, we need to work to elect representatives who feel accountable to us, our community partners, and our values. Below are resources for getting involved and staying informed about candidates, voting, and more! Chicago’s runoff elections are on Tuesday, April 2, and there is so much at stake for Chicago. We are not just voting for candidates -the issues and values we care about are #UpForElection. Check out JCUA’s runoff scorecard analyzing results from our Aldermanic Voter Guide for the five wards with runoff elections. 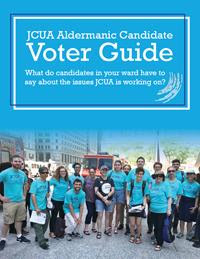 You can also check out JCUA’s updated Aldermanic Candidate Voter Guide for full responses to the questions on the scorecard. These responses were compiled before the general election and have not been changed. Please use this guide to to help you and your community learn more about candidates’ positions on issues related to JCUA’s work and mission. 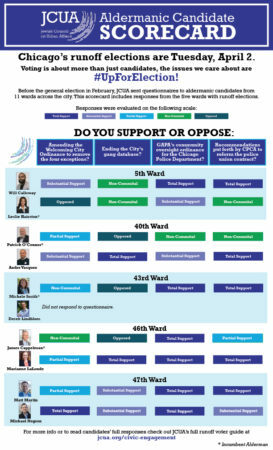 JCUA’s original voter guide included responses from 32 candidates in 11 wards on issues of importance to JCUA including the Welcoming City Ordinance, the Chicago Gang Database, community oversight of the Chicago Police Department, reforms to Fraternal Order of Police Union contract, poverty, racism, antisemitism, and affordable housing. Congregation rabbis have been speaking about the election and the importance of voting in their divrei torah. Expanding Sanctuary Voter Guide: The Chicago Immigration Policy Group and members of the Campaign to Expand Sanctuary asked all candidates running for mayor in Chicago in 2019 to respond to questions about where they stand on the Welcoming City Ordinance and the Gang Database. The responses from the seven candidates who responded are listed here in this guide. After decades of disinvestment in our communities, massive displacement of Black and Brown families, and lack of resources for public schools and affordable housing, it is time for a change. JCUA endorses the Grassroots Collaborative #ReImagineChicago platform. Over 60 JCUA members attended the #ReImagineChicago Mayoral Candidates Forum! See photos here. 50 JCUA members attended Community Renewal Society’s Dr. Martin Luther King, Jr. Faith in Action Assembly and Mayoral Candidates Forum. See photos here. This event led to the creation of Community Renewal Society’s Chicago Mayoral Candidate Scorecard. This scorecard is a summary of the answers asked of the candidates at the forum around police accountability, restoring opportunities and justice reform, community development, and a just economy for safe communities. Run-off Election Day is Tuesday, April 2nd, 2019. Polls open at 6:00 am and close at 7:00 pm. Click here to find your Election Day voting location. Early voting is already open in all 50 wards. You can vote at ANY early voting location. Click here to apply online to vote by mail. The deadline to request a vote-by-mail ballot through this site is March 28th. For each of these options, you must bring TWO forms of ID, including one that shows your current address. Click here to check if you are registered to vote.